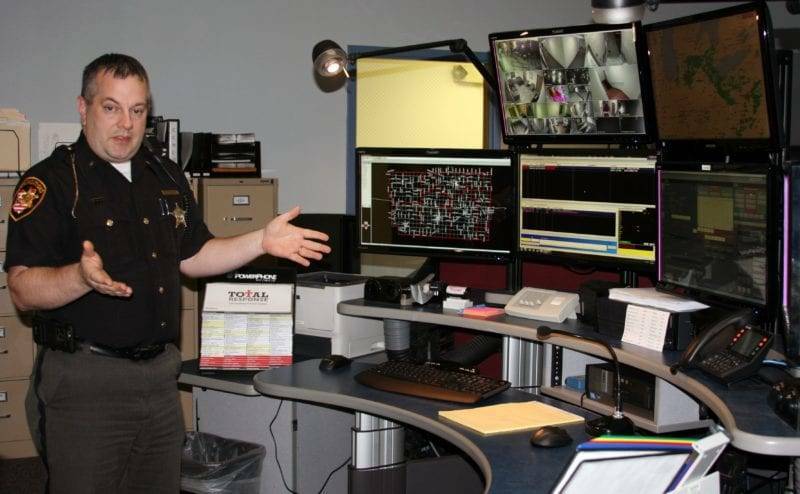 From learning about the “Intoxilyzer 8000” to viewing the state-of-the-art 9-1-1 communication center, citizens enjoyed a sneak peek into the inner-workings of the Fulton County Sherriff’s Office. Thursday evening, November 6, Sheriff Roy Miller hosted an open house. He said that citizens should be very proud of their sheriff’s office, its facilities, and advanced technologies. Most citizens never see the inside of his office and he encouraged them to take this opportunity to stop in, take a tour, and meet staff. Throughout the evening groups of eight to ten citizens did just that as the visited different areas of the Sheriff’s office. In road patrol, Sergeant Trejo explained how they use a high-tech board to monitor rooms in the office as well as the court house, track incoming calls and send deputies where they need to be. He said that they have 19 full-time deputies that patrol the 407 square miles of Fulton County, averaging 125 miles a shift and 32,000 miles a year keeping Fulton County safe. Trejo also said that deputies receive 40 hours of specialized training each year to keep current on new technologies. For example, one deputy recently completed computer forensics training, another attended “crash school” to become a Reconstructionist, and a third just completed a six-week training course with his three-year-old K9 partner, Maggie. Deputy Simon, said that Maggie, who also greeted citizens on the tour, knew German commands, but that she knew the Czech commands of his last K9 partner (who retired last December after ten years of service). The trainers told him it would be easier to teach Maggie Czech than the other way around. He said she picked the new commands up quickly and now knows three languages! She is trained in handler protection, article searches, tracking, building searches and narcotics detection. The last stop on the tour was the 9-1-1 communications center. Richard Kilgour, 911 Coordinator said that the state-of-the-art equipment is funded through the 911 levy. He said that they have two dispatchers working 24/7 and can have up to three dispatchers during busy times (such as during last winter’s snow emergencies). He said that dispatchers take in 19,000 types of calls and are busiest around 7:00 PM. In the future, Kilgour said that people will be able to text in a 911 emergency. Additionally, Lt. Max Nafziger said that so far this year they’ve received 17,872 law enforcement and emergency medical service calls of which deputies responding to 4,477 with an average response time of 13:27 minutes. Be the first to comment on "Citizens Tour Newly Remodeled Fulton County Sheriff’s Office"